It was the morning after the night before and Tyson Fury still couldn't quite believe it. He wasn't the only one. Twelve rounds with the most feared heavyweight champion of the last decade and all Fury had to show for it was a blister on his big toe. A bad blister, granted, but Wladimir Klitschko was supposed to have taken his head off. Fury might make as much as £4m for dethroning Klitschko on a surreal night in Dusseldorf. But forget about private jets. Once the car was loaded up with bling - the WBA, IBF and WBO belts - Fury and family rumbled off to Rotterdam and caught a ferry to Hull, before arriving in Manchester late Monday morning. "I don't feel any different than I did before the fight," said the 27-year-old, his faithful three-piece suit offset by white sports socks in flip-flops. "I always said that winning the heavyweight championship of the world, earning some money and being in the limelight wouldn't change me - unfortunately for the fans." The crowning of Fury will be seen by many as yet more evidence of how low the heavyweight division has fallen. Often uncouth, often outrageous, often embarrassing, Fury does not possess the grace they like to see in a champion. But Fury is a complicated individual. Job done and another song sung, Fury was suddenly subdued and full of respect for Klitschko. And to have any chance of understanding Fury, his occasional outbursts and missteps must first be separated from his deeds in the ring before the puzzle is put back together again. It was a dour and often messy fight at the Esprit Arena and a lot of punters who shelled out 17 quid to watch it on TV will no doubt disagree with those ringside journalists who eulogised Fury's performance. But bumping off a champion who had not lost for 11 years in his own backyard was a very special feat. And Fury made it look simple. Making full use of his superior reach and demonstrating excellent mobility and head movement, the challenger was a conundrum that Klitschko never even came close to solving. "People said nobody could breach his defences but a bit of brains is all it took," said Fury. Fury the madman, Fury the clown, Fury the deluded, all three of them and more reduced the scientific Klitschko - a future hall of fame fighter with 23 successful world title defences to his name - to a spluttering, stuttering wreck. Klitschko never throws a lot of punches but his punch statistics against Fury made for very grim reading: 52 landed, and only 18 of them power punches, over 36 minutes of boxing. Fury landed with more shots in 11 of the 12 rounds. Even in the final few rounds, when it was clear to most observers that Klitschko required a knockout, the champion was unable to get into range and unleash his fabled right hand. Klitschko was apparently petrified of the consequences if he missed. Darts players who are crippled by 'dartitis' are unable to release their arrows. If 'punchitis' exists, Klitschko is apparently riddled with it. It was not how a great champion is supposed to go out, fiddled out of his belts in his own manor. Klitschko has a rematch clause but it might be that he goes over the tapes with his team and decides that, at 39, he's got little left to give. For Fury, victory over Klitschko was the end of a journey that began with him sparring with his brother in the family kitchen. One hand wrapped in one of their father's old gloves, the other wrapped in a dish cloth. Crockery flying everywhere, no doubt plenty of bumps and bruises and Fury claret spilled. "We only had one pair of gloves in the house, hence the dish cloths," said the self-proclaimed 'Gypsy Warrior', who comes from a long line of bareknuckle champions. "We used to have this rug in the kitchen. It wasn't very big but we'd trade punches and whoever fell off the rug first was out. "So when I woke up on Sunday morning, I thought: 'This better not be a dream and I still have to fight tomorrow.' But I finally came round and said: 'New heavyweight champion of the world!' That's got a nice ring to it." After the elation, Fury expects to crash. He has been honest in the past about his fits of mental strife and when he closes the door behind him in his home in Morecambe, the mundane nature of everyday life, that great enemy of elite sportsmen and women, will begin to seep in. But the mundane can be an enemy and a friend, because it will hopefully spur Fury on to achieve more great things. 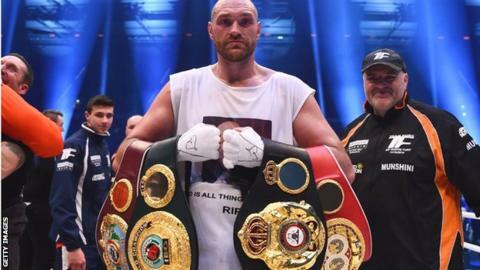 He has warned us to expect more stunts - "I wouldn't be Tyson Fury if I didn't, and now I'm heavyweight champion of the world I've got the perfect stage" - and didn't rule out releasing a single. The kid certainly has a set of lungs on him. What chance Fury's version of Aerosmith's 'I Don't Want to Miss a Thing', which he bellowed to wife Paris after beating Klitschko, being Christmas number one? As Fury put it: "Expect the unexpected." It might be chiselled on his gravestone. Fury the man might be easy to lampoon but Fury the fighter should be lauded. What he pulled off in Dusseldorf ranks among the greatest feats by a British boxer. It might rank among the greatest feats by a British sportsman, full stop. Victory over America's WBC champion Deontay Wilder, if that fight could be made, would make Fury the first undisputed world heavyweight champion since Lennox Lewis in 2000. Olympic champion Anthony Joshua reckons he'll be ready by 2017. Buckle up and don your helmets, there are exciting times ahead. "Wladimir has a sign on the door in his gym," said Fury, with one of his mischievous grins. "'Welcome to big time boxing.' Well, I think we gatecrashed his party. We had too much brains." Hear that? The overgrown kid who dresses as Batman and thinks he's Bette Midler outsmarted the man with a PhD who speaks four languages. Perhaps the ultimate proof that intelligence comes in many different guises.